If you read a lot of science news, you are well aware that food sourced from both flora and fauna can host a variety of unpleasant pathogens, from parasitic worms to diarrhea-inducing bacteria. And while we don’t want to alarm people about the myriad of micro (and sometimes macro-sized) organisms that may hitchhike their way into human bodies, a recent case of infection that occurred in South Korea merits a public service announcement. As reported in The New England Journal of Medicine, a 71-year-old man developed extreme swelling and large blood-filled blisters, called hemorrhagic bullae, on his left hand just 12 hours after eating raw seafood. After two days of these symptoms, accompanied by fever and extreme pain, he went to the emergency room, where physicians Jin Park and Chang-Seop Lee rushed him to surgery to drain the bullae. 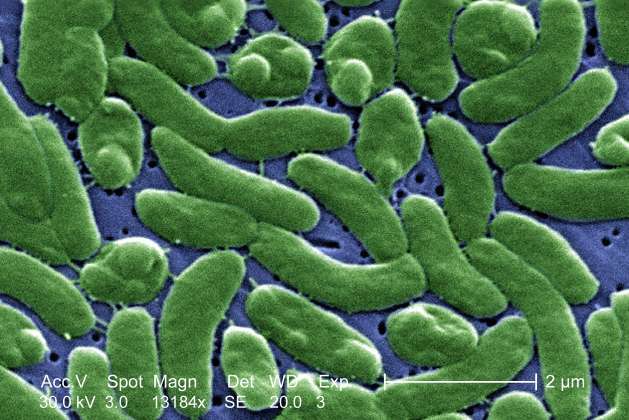 Analysis of the removed fluid quickly revealed the identity of the causative agent: Vibrio vulnificus, an extremely virulent and invasive Gram-negative bacteria that is closely related to the species that causes cholera. V. vulnificus occurs naturally in the warm coastal and brackish waters across the world, where it accumulates in the flesh of filter-feeding shellfish. Most instances of human infection arise from consumption of raw oysters, and researchers from Malaysia estimate that several hundred cases occur each year. This patient had type 2 diabetes, hypertension, and was being treated for advanced kidney disease – three conditions that significantly affect the integrity of blood vessels, particularly those in the extremities, and the body’s ability to clear pathogens from the bloodstream. It is likely that his hand developed hemorrhagic lesions due to previous tissue damage to the vessels in that location. According to the journal American Family Physician, the fatality rate for the septicemic form of the disease is about 50 percent if it has progressed to the point of hemorrhagic bullae. Even with prompt and aggressive medical intervention – intravenous antibiotics and removal of dead tissue – about 30 to 40 percent of patients die, usually because the infection has turned into necrotizing fasciitis, also known as flesh-eating disease. One study reviewing outcomes of 38 people with V. vulnificus septicemia found that the mortality rate is 100 percent for those not treated within 72 hours of the infection onset. Fortunately, the current patient survived, yet as is common with this disease, stopping the infection came at a high cost.